Boy, has the weather ever changed here the last couple of days...in the 40's! Brrrr...not ready for that yet! I have been seeing so many Halloween projects in blogland and lovin' the inspiration but before get started on that, I have a fun little thank you card to share using My Craft Spot's Chunky Alphabet stamp set and the Heart Border metal die set. I folded one flap of the card back in half and then using the Heart Border metal die, I carefully ran the heart die through the cuttlebug only part of the way. I re~placed the heart die and repeated that step two more times. I also cut red hearts to layer on top and adhered them down. The inside pattern paper is from Echo Park~Sweet Girl. I cut a panel and layered a Spellbinders Decorative Labels Eight. I then followed with a Labels Seventeen which I embossed with the swiss dots folder. 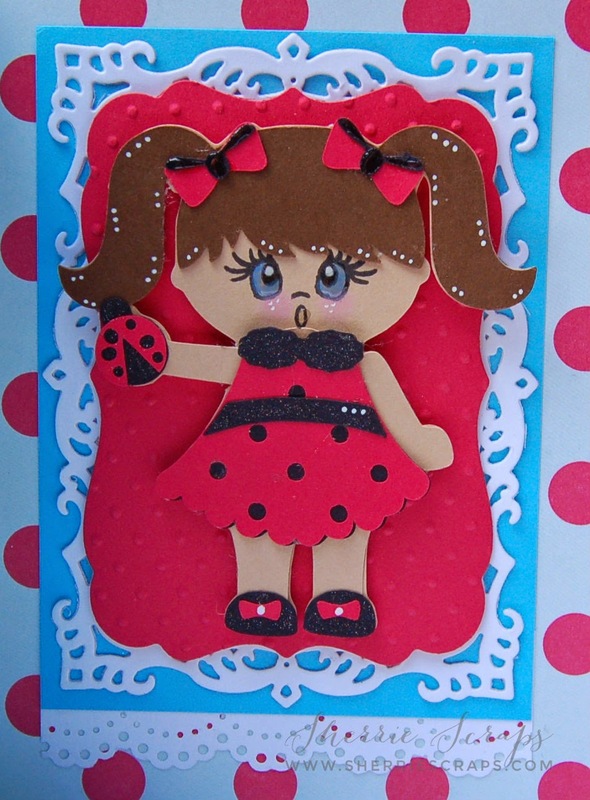 This adorable little girl is from the Silhouette store and the face is stamped with PKSC-21 September 2013 stamp set. I added rosy cheeks, some freckles, glossy accents and doodling to finish it up. This is so sweet and adorable Sherrie, I love the hearts and the PKS face is just the cutest. What a sweet card, I love the design and the colors! The cutie on the inside is adorable too. I can't believe you are have temps in the 40's, we are hovering around 100 degrees, yuck! Still in the 100's here!! LOL!! And you know it will probably still be in the 100's when you are here! LOL!!! I loveeeeeeeee this!! LOVING the colors and that sweet little gal!!!!!! Cute, cute, cute. Love the red, white and blue colors. The images is ADORABLE and love the added ribbon. Love the colours! Amazing my friend. This is sweet as can be. Love your design Sherrie! Precious image, love the card design... Super cute in every angle of it.... Wow your getting cold and we are still burning up with the heat here. LOL! This is adorable !!!! She is too cute !!! I love the colors , and the design is perfect !!! Hope you have a wonderful weekend !! Oh my gosh, this is so adorable, Sherrie!! That little girl is the sweetest!! Such a cute face!! I love how you did the heart border!! It looks amazing!! The bow are such a perfect touch!! Gorgeous card my friend!! I love it!! such a super sweet card!! This is just so adorable! The little girl is so cute I love the heart border with the bows. Look at this Precious little girl!! Oh Gosh!! A Darling card!! I love the style of this card and adore the bows!! Awww....Sherrie! This is such a sweet card!! LOVE LOVE LOVE it!!! Sherrie, I love, love, love this cute card! The details are amazing. Love the ribbon, and hearts! It's just super cute all around! Another amazing creation! What an amazing design!! I am SO impressed with the way you used the heart die to create your card! WOW! So fun to see the Chunky Alphabet stamps too! And that sweet little girl is adorable with her precious expression!! Great card! !